DigiVoice is a leading value added reseller of contact center solutions specializing in voice recording, quality monitoring, voice and data analytics, workforce management, and scheduling. MelCap Partners acted as the sell-side advisor to DigiVoice. 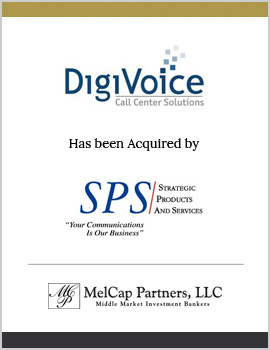 DigiVoice was sold to The Newton Group D/B/A Strategic Products and Services.